I have worked as a freelance illustrator since 1989 and have had many commissions over the years from design agencies, top book publishers and advertising agencies both nationally and internationally. My illustrations are primarily based upon a "wood-cut" style using scraper board, but I also work with watercolour, pen and ink and digitally produced images. I am privileged to have had my illustrations selected twice for the Association Of Illustrators 'Images' Exhibition in London and published in the accompanying annual, which showcases the best of contemporary British illustration. In 2006, my work Construction and Reflection was also short-listed for the Society of Artists Agents Illustration Awards, which was organised in conjunction with Transport for London. Recently I have returned to printmaking, which I love. 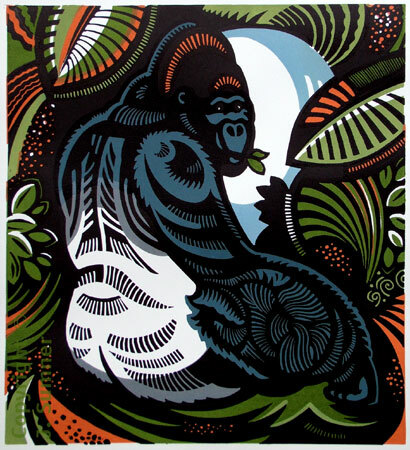 With an interest in the natural world, it gave me the perfect excuse to capture the character and spirit of animals, using bright jewel-like colours and bold, dynamic shapes. Monkeys and primates are a particular favourite as they are so diverse in shape, size, colour and each have a different personality. 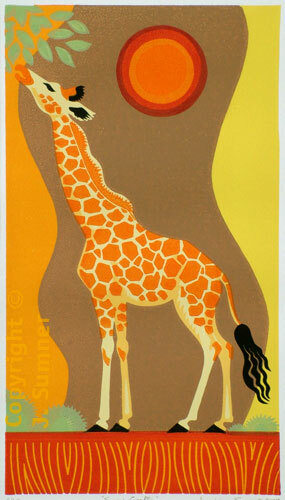 The prints are made up of several colours, each colour printed with a separate lino block. I have exhibited at the Royal Academy Summer Exhibition and also at Originals, the Contemporary Printmaking Show at the Mall Galleries in London. I have work in private collections in the UK and in many other countries around the world. If you would like to see my work, I regularly exhibit both in London and Oxford. London: my work can be seen at the Spring Affordable Art Fair , held in Battersea Park, and also with the Society of Wildlife Artists at the Mall Galleries, held annually in September. In 2009, my print 'Silverback' won the St. Cuthbert's Mill Award. Oxford: I exhibit with Oxford Printmakers at various venues throughout the year. A selection of current prints is also available at Sanders of Oxford along the famous High Street. My full list of previous exhibitions can be seen on the Exhibitions page, and forthcoming and current shows are listed on the News page. I am a member of the Association Of Illustrators and Oxford Printmakers. If you have any queries about my prints or are interested in purchasing a print directly from me, please contact me for price and availability. Prints can be supplied unframed, carefully packaged in tissue paper and strong cardboard to ensure they arrive safely, or framed for a reasonable additional cost.